It’s that time of year again – cuffing season! What’s cuffing season you ask? Well, according to UbranDictionary.com, cuffing season refers to the fall and winter months when normally promiscuous singles begin to look for serious relationships (becoming “cuffed” or tied down) due in part to colder weather and staying indoors. This seasonal phenomenon of pairing-up has inspired songs by John Mayer and Mumford and Sons, but why does it happen? Neurobiologists at Florida State University have identified some of the factors that may be responsible for “cuffing season” by studying prairie voles in love. Prairie voles are a great animal model for studying the neurobiological underpinnings of social attachment because, aside from being adorable, they have a tendency to form enduring monogamous relationships. 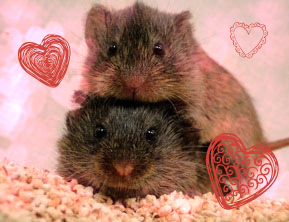 In previous studies, researchers found that prairie voles preference for forming lasting pair-bonds was a result of a neurotransmitter love potion cocktail in the brain involving: oxytocin, vasopressin, and dopamine. Additionally, vole partner preference in female prairie voles was influenced by gene expression of oxytocin (OTR) receptors in the nucleus accumbens, a brain region involved in reward and pleasure. Knowing that gene expression caused changes in paring behavior, Wang and colleagues set out to determine if epigenetic modifications may also be contributing to the why behind “why do voles fall in love?”. Epigenetics is a relatively new field of study looking at changes in gene expression caused by modifications in the availability of the DNA sequence to be read and transcribed. One such epigenetic modification known as histone deacetylation (HDAC) involves histones, which are the globs of protein used by cells to neatly package incredibly long segments of DNA by coiling it around and around. 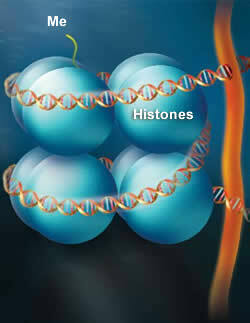 When DNA is tightly wound around histones, the histones take on a unique role in gene regulation by physically varying the accessibility of certain segments of DNA for expression. Think about wrapping yarn around a basketball. If the yarn is tight you can’t fit anything between the string and the ball. In the case of DNA, if it is tightly wound around the histone the cell machinery that reads the nucleic acid sequence cannot do its job. During HDAC, the removal of an acetyl group bound to the histone causes the DNA to condense and coil up further, reducing levels of gene transcription. Wang et al. used HDAC inhibitors that allow histones to loosen their grip on DNA, enhancing gene expression, to see if adult female prairie voles changed their preference for their partner or if they would decide to spend time with a total stranger. Did these HDAC inhibitors make a prairie vole love connection? Sure did. When prairie voles were given HDAC inhibitors there was a significant increase in the amount of time they spent side-by-side touching their partner. But what was the neurobiological action of the HDAC inhibitors? To assess what might be happening down at the molecular level, researchers first looked at whether there were changes in OTR and and vasopressin receptor (V1aR) expression following HDAC inhibition. When HDAC inhibitors were administered, OTR mRNA and protein levels in the nucleus accumbens were significantly elevated. V1aR protein levels, although not mRNA levels, were also increased in this brain region. Researchers then took it a step further to see if the genes for each receptor were more actively transcribed leading to the creation of more protein following HDAC inhibition and decided to look at histone acetylation in the OTR and V1aR gene promoter region, a region of DNA that initiates transcription of a gene. Following administration of HDAC inhibitor, there was a significant increase in histone acetylation in both receptors’ promoter regions suggesting that epigenetic modification was impacting behavior specifically at the promoter site. To ensure that this finding was specific to OTRs and V1aRs in the nucleus accumbens these receptors were pharmacologically blocked. When either of these receptors no longer functioned, the HDAC inhibitors effect was diminished and prairie voles stopped caring whether or not they spent time with the love of their life or a complete stranger. Finally, researchers found that mating triggered the same OTR and V1aR mechanism of action on gene promoters as administering HDAC inhibitors in the laboratory, reinforcing idea that in nature epigenetics do play a part in the neurobiology of monogamous relationships. Now I definitely don’t recommend trying to go inject that cutie with a booty you’ve had your eye on with HDAC inhibitors in attempt to woo them as your cuffing season anxieties set in. That would definitely land you with jail time and perhaps give cuffing season a completely new meaning. If you really want to meet someone as the leaves start to change and the nights get cooler, remember a much better way to go is with confidence and a smile.